One of the first things you immediately notice about Brooke Waggoner is her vivid red hair. It certainly made her stand out as the keyboard player for The Peacocks, the all-female backing band for Jack White. In an interview with Spinner, Waggoner says touring with White was “a heightened level of touring and live playing that I haven’t ever had to experience.” Over the last six years, she has been writing, orchestrating, and arranging her own releases. 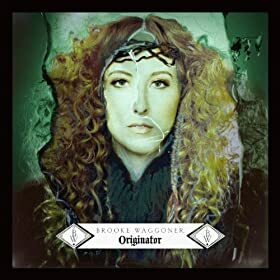 In March, Waggoner will be releasing her third full-length album, Originator. The album opens up with “Shiftshape,” a song that certainly fits the title on an instrumental level. The opening lyrics are sung with a heavy flanger effect, but her voice quickly reverts back to normal to sing the rest of the tune. While the piano certainly leads the way in most songs, the drums, guitars, and orchestral instruments make their presence known throughout every song. The single from the album is “Rumble,” and it is arguably the most pop-friendly song on the record. The piano riff that opens up the song quickly draws you in for more, and by the end of the first verse, you are completely pulled into the song. The strong brass arrangement and roaring choir leading the march throughout the second half of the song. Weighing in at just over 2 minutes, the song most definitely packs a punch in its limited time. Led again by the piano, “Perish” brings former listeners to familiar territory. The busy music playing through the verse all clears out during the chorus, making room for Waggoner’s heavenly vocals to belt out: “Go on, go on and steady me out. Oh, I got a lot to say. Take hold, take hold and settle me down. Living like I’ll never die.” Following with the lyrical theme of the song, the song slowly closes out with a gorgeous choir arrangement of the chorus that will make the hair on the back of your neck stand on end. You can order the album on Amazon and iTunes. You can also like her on Facebook and follow her on Twitter. In 2011, almost out of nowhere, a band called Leagues released a self-titled EP with 3 songs. From the first listen to the short EP, you instantly wanted to hear more from them as soon as possible. Unfortunately for those immediate fans, it took nearly 2 years before there was a proper release. 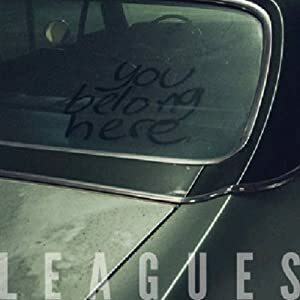 With the help of a PledgeMusic campaign, Leagues self-released their debut album, You Belong Here. Comprised of singer Thad Cockrell, guitarist Tyler Burkum , and drummer Jeremy Luito, the trio cuts right to the chase with these hard hitting songs. The song that will keep you hooked in the second half of the album is most definitely “Magic.” The simple but stellar guitar riff and bass line that runs throughout the song reminds you of something you’d hear from the great songsmith Jack White. The soaring falsetto vocals of Thad Cockrell are what make the song, though. The simple but powerful chorus make the song one that will be sung at every live show. The album ends with two ballads, “Friendly Fire” being the most poignant of the two. Starting with piano chords and vocals, the song tells a story of love and heartbreak: “I wasn’t fighting with you, I was fighting for you. I was trying to do what I could do. And if it came across wrong, that wasn’t my intention. Sometimes I come across too strong, I think I just failed to mention. And if I ever hurt you, that was never my desire. You’ve been wounded by my friendly fire.” By the end of song, swelling guitars roll in and add a heart-rending emotion to an already sad song. The album has already seen some recognition from the likes of MTV and Esquire, and for very good reason. This album is filled with one toe-tapping song after another. Here’s to hoping another great independent artists gets some well deserved recognition. You can pre-order the album on Amazon or iTunes. You can also like them on Facebook and follow them on Twitter.